The digital world has made it possible for enterprises to reach, and deliver services to customers near and far through mobile applications. However, regular and rapid rollout of features and new versions across geographies and different operating systems call for flawless applications and mobile app testing capabilities. 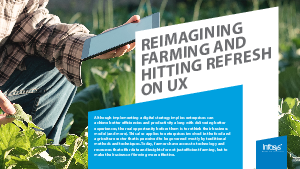 A chemical giant wanted to deliver agriculture data and services to their farmer clients across geographies through their mobile applications. See how Infosys helped and the five key takeaways from the project.